It’s hard to imagine anything worse that could be said about Jesus. Did they really think He was possessed by the evil one? It appears so. What a sad and bizarre thing to say about the Son of God. Here is God Himself, in the person of Jesus, offering a promise of eternal life. He reveals the sacred Truth that obedience to His Word is the pathway to eternal happiness and that everyone needs to know this Truth and live it. Jesus speaks this freely and openly, but the response from some hearing this message is deeply disappointing, slanderous and malicious. It’s hard to know what was going on in their minds to cause them to say such a thing. Perhaps they were jealous of Jesus, or perhaps they were just seriously confused. Whatever the case may be, they spoke something that was seriously damaging. The damage of such a statement was not so much toward Jesus; rather, it was damaging to themselves as well as to those around Him. 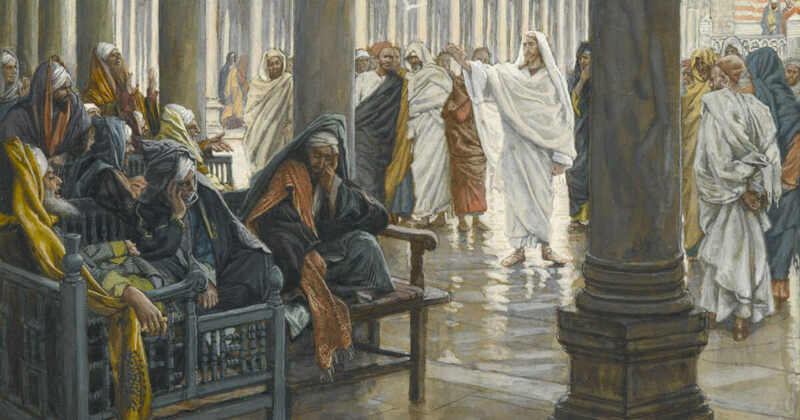 Jesus could personally handle whatever was spoken about Him, but others could not. It is important to understand that our own words can do great damage to ourselves and to others. First of all, their words did damage to themselves. By speaking such an erroneous statement publicly, they start down the path of obstinacy. It takes great humility to retract such a statement in the future. So it is with us. When we verbalize something that is damaging toward another, it’s hard to retract it. It’s hard to later apologize and mend the wound we have caused. The damage is primarily done to our own heart in that it’s hard to let go of our error and humbly move forward. But this must be done if we want to undo the damage. Secondly, this comment also did damage to those who were listening. Some may have rejected this malicious statement but others may have pondered it and started to wonder if in fact Jesus was possessed. Thus, seeds of doubt were sown. We must all realize that our words affect others and we must strive to speak them with the utmost care and charity. Reflect, today, upon your own speech. Are there things you have spoken to others that you now realize were erroneous or misleading? If so, have you sought to undo the damage by retracting your words and apologizing? Reflect, also, upon the fact that it’s easy to be drawn into the malicious conversation of others. Have you allowed yourself to be influenced by such conversations? If so, resolve to silence your ears to such errors and look for ways to speak the truth. Lord, give me the grace of speaking holy words that always give You glory and reflect the eternal Truths alive in Your Heart. Help me to also be aware of the lies all around me in this world of sin. May Your Heart filter out the errors and allow only the seeds of Truth to be planted in my own mind and heart. Jesus, I trust in You.